Immortal Beloved by Cate Tiernan. (Grades 8+) Little, Brown, September 2010. 416 pages. Reviewed from ARC provided by publisher. Nastasya is a 400-year-old immortal. You'd think that nothing would faze her, but the truth is she's lost in a swirl of parties, drugs, and beautiful partners - anything to distract her from the overwhelming notion of living forever. Nastasya gets a wake up call when she discovers that her best friends are dabbling in black magick and she heads to River's Edge, a home for wayward immortals who have nowhere else to turn. There she discovers that she might be able to use her magick for good and she also meets Reyn, a beautiful immortal to which she feels an instant attraction. There are secrets at River's End and as Nastasya starts uncovering repressed memories, she'll have to decide whether to stay or to go. To stay might break her heart, to stay might break her soul. Paranormal's hot right now, there's no debate about that, and Immortal Beloved will fit the bill for those insatiable paranormal fans. All the elements are here, namely a brooding hunk of a love interest. For me, the most appealing aspect of the book was the magick lore. Not much was really explained about the immortal thing (I'm assuming that'll come in one of the later books), but Nastasya learns a lot about her magick during her time at River's Edge. I really enjoyed the scenes where she's figuring out spells and stone magic and things like that. Even though Nastasya's not technically a witch, I think the prevalence of magic will appeal to fans of books about witches and magic. This is very much the first book in a series and a lot of it felt like set-up for the next book. As such, it felt like a lot happened, but not much happened. That said, I enjoyed reading the book, even as I was snorting over Nastasya's instant, unexplainable attraction to Reyn and the big twist that I figure out almost immediately. 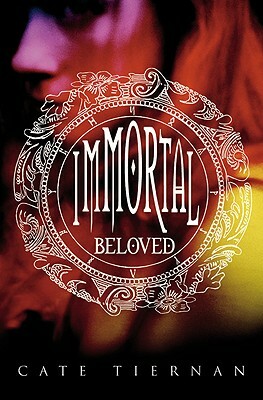 I'd recommend Immortal Beloved to die-hard paranormal fans, especially fans of Twilight or Sophie Jordan's Firelight. Read more reviews at A Good Addiction and Confessions of a Book Addict. Immortal Beloved is on shelves now!